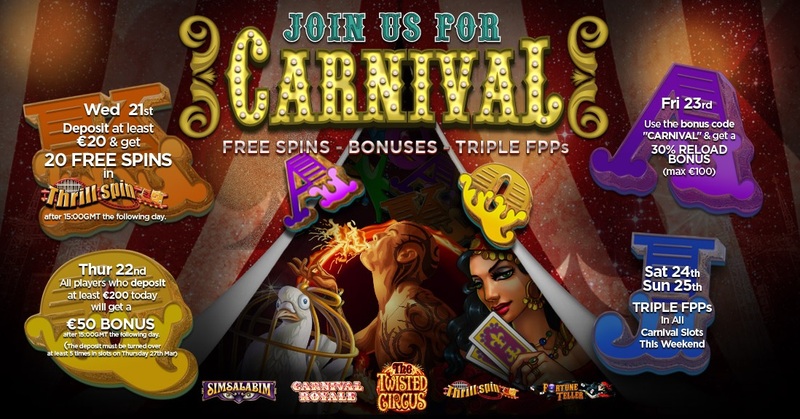 Next Casino is running another themed promotion week and this time the theme is Carnival. Every day from May 21st until May 25th you are able to claim a daily promotion. All you have to do is make the qualifying deposit or play Carnival themed slots. The slots that Next Casino uses for this promotional week are Simsalabim, Carnival Royal, The Twisted Circus, Thrill Spin and Fortune Teller. Frequent player points are earned by playing any game at Next Casino. Normally you earn 1 point for every €1,- you wager. And every 100 points can be traded in for €1,- in cash. Next Casino runs these promotional weeks once or twice a month.